During Anderson Cooper 360, CNN meteorologist Jennifer Gray had a rough hit when reporting the first images of Pluto’s surface. First of all, her graphics labeled the largest of Pluto’s moons, Charon, “Churon.” Gray repeated Churon throughout the entire segment, and it was plastered throughout the on-screen graphics. Then, she identified the atmosphere on Pluto as being made of “nitron” — instead of, you know, nitrogen. 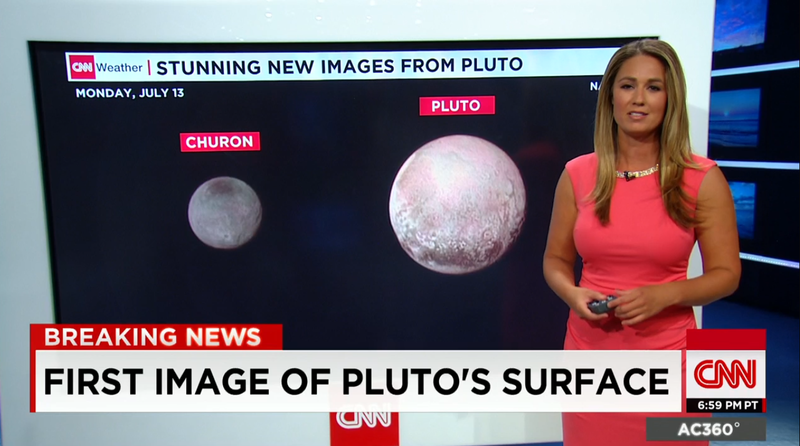 CNN, take two parts hydron and one part oxon and you get water on Pluto. That’s if you are a Mickey Mouse outfit. Is Don Lemon going to be live from Pluto later or maybe Barbara Starr will have the latest threats from Pluto at the Pentagon. “Up next on The Situation Room The threat from PLUTO could the new photos of the planet mean there will be an attack on the United States, Stand by we will have the latest LIVE from PLuto when we come back”. “Arwa Damon & Nick Paton-Walsh are live from Pluto for us next reporting in the way only CNN can” “Arwa what’s the atmosphere like there give us a perspective”.